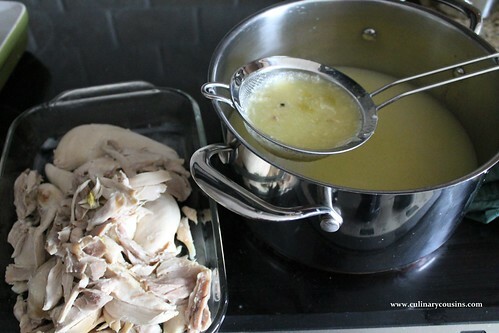 The stock part of this recipe has become my go-to for basic chicken stock, which I make as often as I can. The stuff in the box is great and easy, but there’s nothing like the taste of homemade stock. 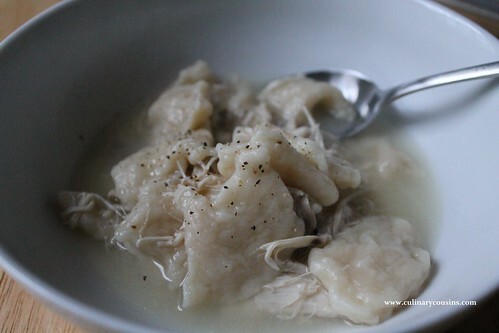 My great-grandmother, whom we called “Ti,” did in fact have a chicken and dumplings recipe. But, sadly, I never learned it. However, I just found a couple of her cookbooks and recipe box, so let’s cross our fingers that somebody wrote it down somewhere. Ti’s “chicken and dumplings” — at least the version her daughter, my grandmother, made — was more like chicken soup than chicken and dumplings. So that’s why I like this recipe. The stock makes a rich sauce, and the dumplings are light and doughy, a nice cross between a noodle and a biscuit. Beware, though. This is not the recipe for the week that you’ve given up carbs. It is rib-sticking, traditional southern fare. *If you only like white meat, just buy the equivalent in bone-in chicken breasts, etc. You must have meat on the bones, though — bones are key! 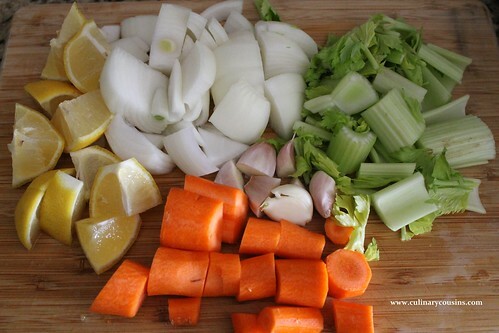 Chop the vegetables in large chunks and throw them into a large stock pot. Well, don’t throw them. Just scoop and drop, maybe. Peel the garlic, smash the cloves but leave them whole (or cut them in half) and add it to the pot. Rinse the chicken in water, and remove any bits inside the cavity. Place the chicken on top of the vegetables. Add the bay leaves, peppercorns and salt. Cover the chicken with water by about an inch. Bring the pot to a boil, then reduce the heat to medium and simmer uncovered for 90 minutes. If at any point the water looks too low, add more a cup at a time. After 90 minutes, carefully remove the chicken from the pot and set it aside to cool. Strain the broth into another pot. 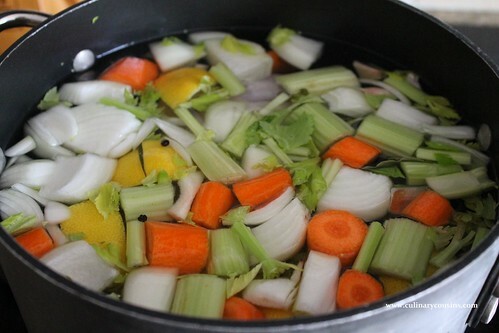 You could refrigerate the broth overnight to allow the fat to rise to the top. Then skim it off with a spoon. Or, just move ahead to the next step. When the chicken has cooled enough to handle, shred it into large chunks. Discard the bones, skin and cooked vegetables. **You can use all buttermilk, or all milk. In a small bowl, mix all ingredients together until they form a ball of dough. Let the dough sit and rest for 5 to 10 minutes. Lightly dust a cutting board with flour. 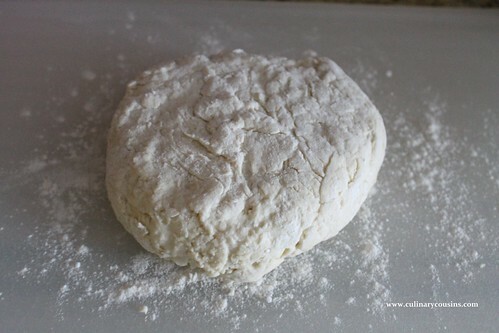 Roll out the dough until it’s about 1/4 to 1/2 inch thick. 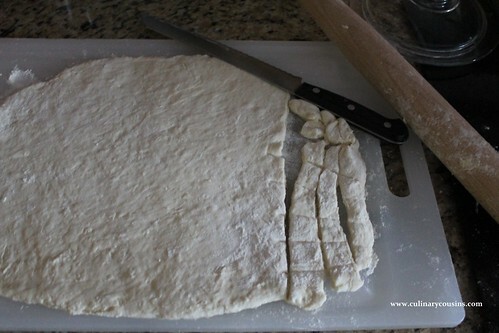 Cut the dough into 1/2 to 1 inch squares. Bring the broth to a boil. Drop the dumplings into the broth one at a time. Even though it looks like a lot, use all the dumplings. 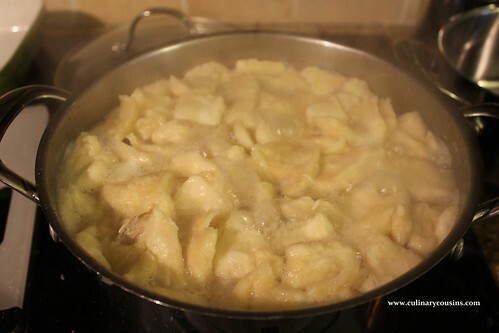 They will puff and rise to the top, so stir them every so often as you add new dumplings. Cook for 20-30 minutes, stirring occasionally, until the dumplings are cooked. Add the chicken and cook another 5 to 10 minutes, until the gravy has thickened. This looks yummy. Not sure I have a big enough pot though. Hmmm. I never thought there were lemons in chicken stock either. Cool. to enrich the broth, I return all the veggies, meat scraps, bones and skin back to the broth and cook tightly covered for another 30-45 min then strain it for use.